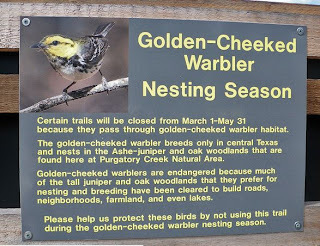 The golden-cheeked warbler is an endangered species of bird that breeds only in central Texas and nests in the Ashe-juniper and oak found in some of our natural areas. In an effort to protect these rare birds certain trails in Purgatory Creek Natural Area and Spring Lake Natural Area will be closed from March 1-May 31 annually. Click here for maps of the closed areas.